According to Wikipedia, the word Potpourri comes from the French language meaning a Spanish stew containing many different ingredients. In French the word pot means the same as it does in English and pourri means rotten. Therefore, potpourri means a pot of rotten stew! I really cannot vouch for the French version of these words; however, in today’s English language the word potpourri means a container of a wide variety of decoratively shaped dried plant material with strong natural scents that is used to make a room smell fresh and clean. The operative words here are a wide variety of subjects about which we are going to discuss regarding dog and cat issues in our presence, or Petpourri as I have chosen to label it. Recently my wife and I had the opportunity to take a European River Cruise from Budapest, Hungary to Amsterdam in The Netherlands. 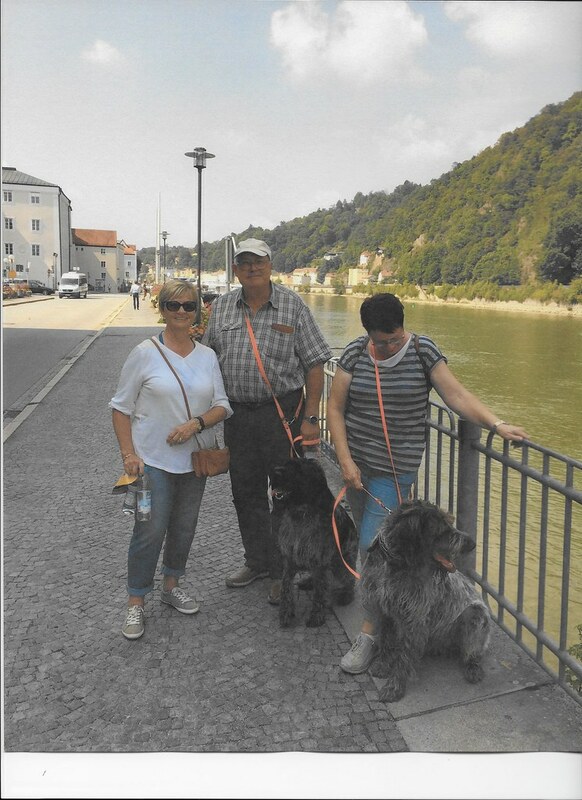 It was a wonderful experience sailing on the Danube River across Hungary, Slovenia and Austria, and then crossing into Germany before cruising on the Main Canal and into the Rhine River into and across Holland. Stopping and visiting in nineteen cities, we were able to observe many of the customs of the populations that inhabit these beautiful countries in addition to seeing and taking pictures of the magnificent Medieval architecture many of the cities contain. Being a veterinarian, the one thing I noticed more than the architecture and the historical customs of the people was the fact that pets are as common and cherished as much in Eastern and Northern Europe as they are in the United States. 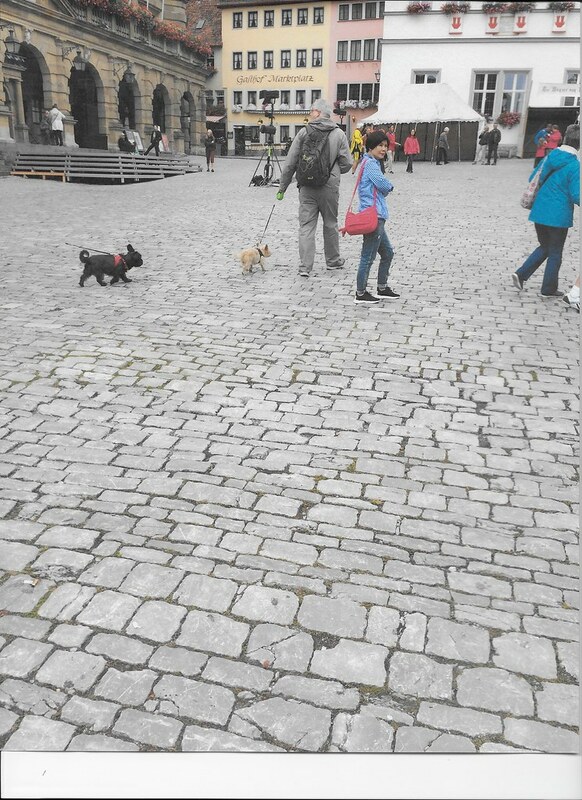 Everywhere we went to look at castles, museums, music halls, restaurants and on the streets, people had their dogs on a leash and in buggies much like we see in America. Again, being a veterinarian, I stopped to talk to many of these people who were just as interested in talking to me about their pets as they were about talking about their churches, castles, Christmas ornament shops or parliamentary buildings. We saw dogs of all breeds from large Russian Ovcharkas (sometimes called Caucasian 0vcharkas), Australian Healers and French Poodles all the way down in size to French Bulldogs and Bison Friese dogs with a few Heinz 57 mixed breeds thrown in for good measure. It was a great experience chatting with the people about their four-legged family members in all these countries. Fortunately, most people in Europe speak English so we were able to communicate with them freely. One new experience for me on this European trip involved a service dog. Bomb sniffing dogs in airports and places where there were crowds of people are seen frequently. In addition to bomb materials, I am sure they were also looking for cannabis that was being transported from place to place. There were seeing eye dogs and police dogs in many of the cities we visited. The new experience occurred at the Amsterdam Airport while we were inside airport security walking from the arrival gate to our connecting flight gate. As we were walking along the corridor we approached three military police officers, one of whom had a service dog on leash. This dog was a greyhound type dog, very friendly who came up to me and literally bumped my upper right leg. The military policewoman asked me to step aside where she asked how much money I had in my pocket. I stated that I did have money in that pocket, but it was just a few hundred dollars. She asked for me to take it out, so she could see it, and I did. She looked at the money clip briefly and said I was fine and wished me a good day and safe flight. This service dog was apparently looking for large stashes of cash that was being transported from country to country for laundering money or purchasing drugs. A total new experience for me to have a service dog identify that I was carrying a money clip with money in my pocket. In the Chinese calendar, 2018 is the year of the dog. Many companies are advertising their products utilizing dogs as part of their advertisements. Government agencies and commercial companies are using the image of dogs in their promotional offerings. I think this is a great time to feature the value and companionship of our family dogs for the good of global unification. Perhaps, through the influence of the dog, the world can become a safer and better place for people to grow and appreciate each other, as we appreciate our dogs. I saw a newspaper article where the Russian Armed Forces was utilizing a recruitment video featuring warm, cuddly puppies to help to improve its image all over the world. Also, there seemed to be a recent increase of Christmas card greetings utilizing dogs as part of the holiday message. That may be a good thing! Lung cancer is one of the biggest causes of cancer death in New Zealand. The exact cause is not known why lung cancer is so prevalent in that country; however, a medical research foundation has recently funded a research project to try to find out about these cases of lung cancer in its formative state. Dr. Tim Edwards and his team collected breath and saliva samples from a local health clinic and are training pet dogs to sniff those samples to collect the dog’s reactions or time spent sniffing the sample. By utilizing some samples that contain known cancer cells and some samples that are from known sources that do not have indications of cancer, Dr. Edwards is able to speculate which samples might contain cancer cells long before they would show symptoms in the real patient. It has been speculated in earlier cancer studies that cancer cells may produce a bouquet of chemical smells that dogs with their sensitive olfactory or smelling capabilities possess. There is much work to be done in this area; however, the outcomes appear to be promising. By far, the most common surgery performed on pets in the United States are spay and neuter procedures. These surgeries remove the reproductive organs of both male and female animals which helps to prevent unwanted pregnancies and pet overpopulation. However, spaying and neutering of male and female dogs and cats has other beneficial outcomes as well. It has been established that cancer of the mammary glands is seven times more likely to occur in unspayed female dogs than in those that have been spayed. Also, one in four unspayed female dogs have been shown to have developed some level of uterine infection. The optimal time to spay dogs to prevent mammary tumors is to spay them before they are 2 ½ years of age. However, the optimal time to spay and neuter dogs is not established if all types of disease and body condition are taken into consideration. As an example, enlarged prostate conditions in the male dog can start in mid-life and will progress as the dog increases in age. The older they are the larger the prostate gland may become. This is a non-cancerous condition, but does increase in intensity as the dog ages causing other potential problems specifically in the urinary tract. Testicular cancer in intact male dogs will affect approximately one in one-hundred dogs. The greatest down side of not spaying or neutering your pet dog or cat is overweight or obesity. It has been established that 54% of dogs and 59% of cats in the United States are overweight or obese. Talk to your veterinarian about how to control the weight of your pet after spaying or neutering has been performed. The Veterinary Task Force on Feline Sterilization calls for sterilization of cats by 5 months of age. This procedure should be scheduled at the end of the vaccination series for cats. The winter months of 2017-2018 have been noticeably severe for the Influenza virus for humans, dogs and poultry. There has been an unprecedented occurrence of influenza in humans this year. Dozens of countries world-wide have reported avian influenza whereby entire flocks of chickens must be depopulated to prevent spread of the virus to other poultry and egg producing companies. Canine influenza has now been diagnosed in more than 40 states in the United States. It all started in March 2015 in and around the Chicago area when more than a thousand dogs were diagnosed with canine influenza. In the beginning, it was thought that outbreak was being caused by the H3N8 virus that had been around since being discovered by the University of Florida in 2004 at various greyhound race tracks and had sporadically infected susceptible dogs in any location in which the local dog population had not been exposed to the virus to develop passive immunity. However, much to the chagrin of veterinarians and pet owners alike, the virus that infected thousands of dogs in the Chicago area was due to the H3N2 virus that had been isolated only in Asia prior to the Chicago outbreak. A vaccine for H3N8 influenza virus had been developed and approved for use in 2009; however, no vaccine for H3N2 had been developed at that time and the virus was extremely virulent, meaning it spread to all susceptible dogs quite easily. When the virus enters a community where there has never been exposure all dogs are susceptible, and it will cause symptoms in more than 80% of those dogs with as many as 10% of those infected developing into much more serious conditions including pneumonia. Veterinary pharmaceutical companies immediately started research on vaccines for the H3N2 virus and today, most veterinary hospitals offer a bivalent vaccine that protects against both H3N2 and H3N8 viruses. It is recommended that all dogs get a flu vaccine, especially those dogs that visit boarding kennels, dog parks, grooming facilities and travel with their owners. It has been determined that the H3N2 canine influenza virus can and has infected cats. There is no vaccine available for cats currently. Also at this time, there is no evidence of transmission of H3N8 canine influenza from dogs to horses, ferrets, or other animal species including humans. The H3N2 strain, however, has been reported in Asia to infect cats, and there’s some evidence that guinea pigs and ferrets can become infected. There are no cases identified where transmission of either virus can be transmitted to humans. The past year has been a devastating year for pets from natural or man-made disasters. Three major hurricanes, flooding, tornados, wildfires and diseases have taken their toll on our family pet population. There are many orphaned pets that are in shelters and rescue facilities waiting for a forever-home. Please consider adopting one of these pets. Disasters can strike at any time and at any place. Be prepared with all family members by having an evacuation plan, an evacuation survival kit and numerous practice sessions in place. Written instructions, both for emergency first responders and family members may save time and lives. Lives, money, and anxiety can be spared with proper emergency and disaster planning. And that makes for a better life for all family members, including the animals in our lives.